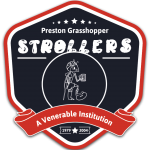 The precise details are lost in the mists of time and are probably better remaining there but the fact remains that as good Europeans the Strollers have made their contribution to Europe. It was in 1994 that Chris Ashman was exported in an effort to improve (well at least change) European relations. Having come on tour with us in the usual way ~ coach to Hull, boat to Zeebrugge, coach to Antwerp ~ he failed to return. Suffice it to say there may have been a young lady involved or it may have been the booze but whichever he departed Albion’s shores for good and has remained ever since assimilating Belgian culture and confirming the native Belgian’s view of the British stereotype as he knocks back another “Bolleke”. Unkind rumour has it that many Strollers voted remain in the 2016 Brexit Referendum lest Brexit led to Chris being expelled back to England. Anyway if you stumble across an Englishman in Antwerp or Dendermonde wearing a piece of Strollers’ apparel buy him a “Bolleke” and you will not need to say another word as he regales you with story after story. Who wants to volunteer for deportation?